Comments Off on Retina 2012 Conference Report. 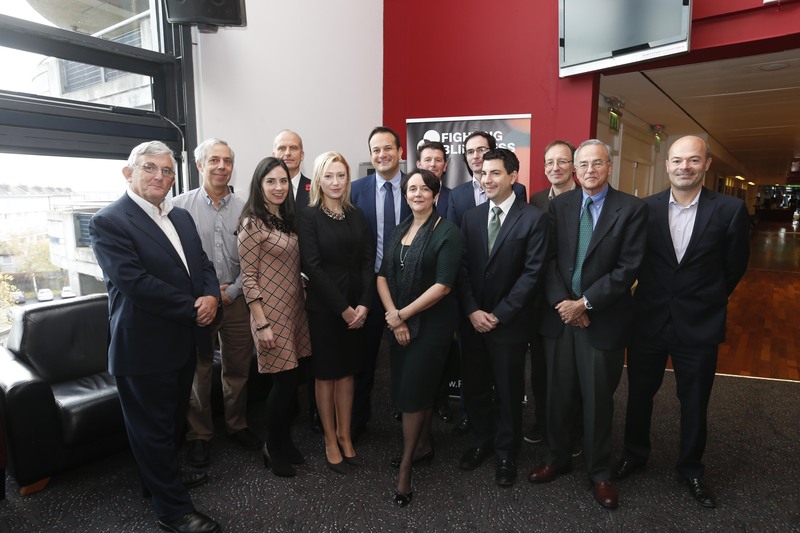 Pictured above L-R; Prof Brendan Buckley, Prof Donald Zack, Dr Maria Meehan, Prof Robert MacLaren, Avril Daly, Minister Leo Varadkar, Dr Giuliana Silvestri, Mr David Keegan, Dr Matthew Campbell, Dr Mark Pennesi, Prof Marius Ader, Prof Gustavo Aguirre, Mr Tim Jackson. Prof Aguirre is an esteemed veterinarian researcher whose seminal work in identifying, then treating dogs with a form of Leber congenital amaurosis was a critical step in moving gene-based treatments into human clinical trials for retinal disease. Gus updated the conference on his latest research where his lab has identified a number of other retinal diseases in dogs, which act as a model for learning more about the human equivalent conditions. These include dog models of Best disease, achromatopsia, and a form of X-linkedretinitis pigmentosa caused by mutations in the RPGR gene. Proving the efficacy of gene based treatments in dogs provides a key pathway for translation of this work towards therapy development in humans. Paul and David updated the group on the progress that has happened since the last meeting and explained the different stages of the project. With the help of two Fighting Blindness supported clinicians, Dr Emma Duignan and Dr Tahira Saad, over 600 Irish people are now part of this growing project. Giuliana gave an overview of her continued efforts in Northern Ireland to characterise the population of NI and expressed her delight in teaming up with David and Paul on developing an all-Ireland register of inherited retinal disease. Matthew gave an overview of the huge technical challenges that he faces in managing the data generation that such a project produces, and the procedure through which candidate genes can be identified that may be causative for a condition. The discussion ended with a ‘call to action’ for anyone who has not yet signed up for Target 5000, but would like to get involved, to contact Fighting Blindness on 01 6789 004 ortarget5000@fightingblindness.ie for more information. Robin Ali is Professor of Human Molecular Genetics at UCL Institute of Ophthalmology, London where he is also Head of Department of Genetics. He also holds faculty positions at UCL Institute of Child Health and the Biomedical Research Centre for Ophthalmology, Moorfields Eye Hospital. 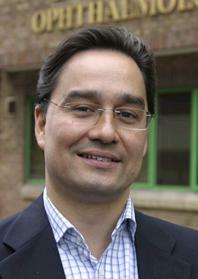 The main focus of his research is the development of gene and cell therapy for the treatment of retinal disorders. Robin Ali and members of his team have received numerous prizes and awards for their work on developing new treatments for retinal degeneration including the Pfizer /ARVO Karl Camras Translational Award in 2010 and Alcon Research Institute Award in 2009. In 2007 he was elected to the UK Academy of Medical Sciences and in 2009 appointed Senior Investigator of The UK National Institute of Health Research. He serves on the advisory boards of a number of funding bodies including the UK Medical Research Council (Neurosciences and Mental Health Board and the Translational Stem Cell Research Committee) as well as the advisory boards of pharmaceutical and biotech companies, including Alcon Pharmaceuticals and ReGenX. He is also Associate Director of Research at Fighting Blindness. He obtained his BSc (1988) and PhD in Genetics (1993) at University College London, continued by postdoctoral training at the MRC National Institute for Medical Research and UCL Institute of Ophthalmology and established his laboratory at UCL Institute of Ophthalmology in 1999.